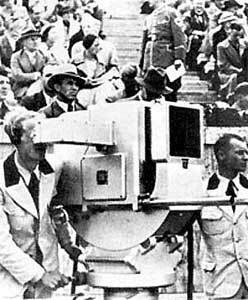 The 1936 Berlin Olympic games were the first to be televised. The Nazi government used the Olympics as a propaganda tool, and the presence of television was used to highlight Germany's sophisticated technology. Both Vladimir Zworykin's Iconoscope camera pick up tube and Philo Farnsworth's Image Dissector camera pick up tube were adopted and operated in German cameras. In 1936 Zworykin, a Russian Jew, was working for RCA labs and Farnsworth, a Utah Mormon, was working with Philco. Both would have been persecuted for their religious and ethnic backgrounds in Nazi Germany, and yet their inventions made television cameras possible. Actually, the 180 line German television system was crude compared to the 405 line British system. England inaugurated regularly scheduled programming in the fall of 1936. 21 cameras were used. Some used image dissectors and some used iconoscopes. 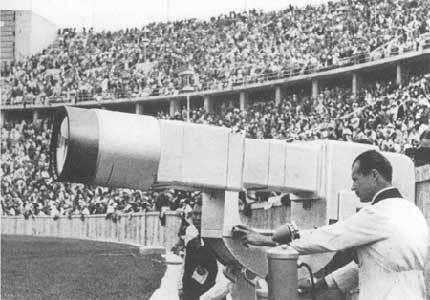 The most impressive was the Fernsehkanonen (television canon), which was 6 feet long. Three of these cameras were used at the Olympics. 28 viewing rooms were set up around Berlin, where 150,000 people are estimated to have seen the Olympics. 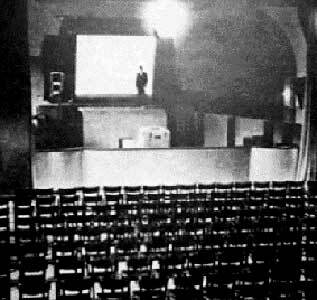 Projection sets were used to produce 8 x 10 foot images. 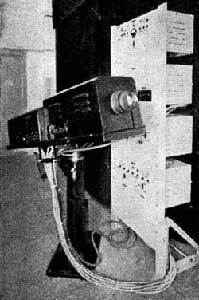 The signals were transmitted by coaxial cable to the viewing rooms.